The shape of a nanoparticle has been demonstrated to control its performance in many applications including medicine and sensing. Identification of the factors determining a nanoparticle shape can yield precise control on its functionality. We identify the role of pH, molecular architecture, composition and confinement on the shape of two types of nanoparticles: (1) a multicomponent vesicle and (2) a dendrimer. Via the use of a mesoscopic simulation technique called Dissipative Particle Dynamics, we examine shape-tunable multi-component vesicles. The shape of a vesicle is determined by the molecular stiffness, and dissimilarity in the hydrocarbon tail groups, along with the relative concentration of the species, the functional group length and the confinement volume. We use these parameters to design stable multi-component vesicles with target shapes through the self-assembly of a binary mixture composed of amphiphilic molecular species, such as end-functionalized lipids, and phospholipids. We observe the hybrid vesicles to transform from a spherical to an ellipsoidal shape with increasing relative concentrations of the end-functionalized lipids, functional group length and dissimilarity in the hydrocarbon tail groups along with decrease in the molecular stiffness. We also draw correspondence with experimental studies on the shape transformations of the hybrid vesicles through phase diagrams of the reduced volume, the ratio of the minimum and maximum radii, and the interfacial line tension, as a function of the concentration of the hairy lipids and the hydrocarbon tail molecular chain stiffness. We examine the effect of confinement on the growth dynamics and shape of the hybrid aggregate, and demonstrate the formation of different morphologies, such as oblate and prolate shaped vesicles and bicelles. We perform these investigations by varying the degree of nanoscale confinement, for different relative concentrations of the species and the length of the functional groups. Via the Molecular Dynamics simulation technique along with an implicit solvent coarse-grained model, we find a polyamidoamine dendrimer to become increasingly spherical with generations, acidic and basic pH. Our findings will guide the design of shape-specific or tunable nanoparticles, and can be used for the prediction of novel hybrid soft materials for applications in the medicine. 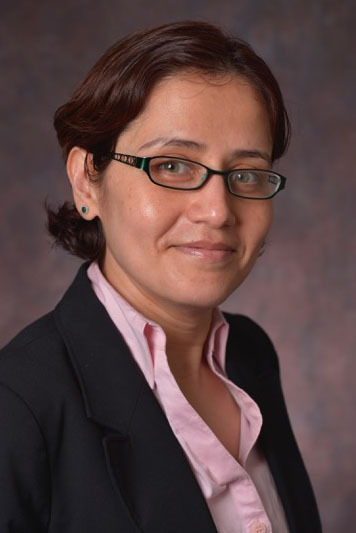 Dr. Meenakshi Dutt joined Rutgers University in July 2011 as a tenure-track Assistant Professor. She obtained her B.Sc. from the University of Delhi, India followed by a M.Sc. from the Indian Institute of Technologyâ€”Delhi, India and her Doctorate in Physics from Duke University, USA. She has held research positions at the Pfizer Institute of Pharmaceutical Materials Science at the University of Cambridge, UK, the University of Illinois at Urbana-Champaign and the University of Pittsburgh. Her research contributions were recently recognized by the community through the conferral of the OpenEye Junior Faculty ACS COMP award for Fall 2015.